Jack Butala: Great Land Buys Do Not Matter if They Dont Sell. Every Single month we give away a property for free. It’s super simple to qualify. Two simple steps. Leave us your feedback for this podcast on iTunes and number two, get the free ebook at landacademy.com, you don’t even have to read it. Thanks for listening. Jak Butala for Land Academy. Welcome to our cash flow from land show. We show you how to buy property for half of what’s worth and resell it the very next day. Great information and instruction from Jack, that’s me. 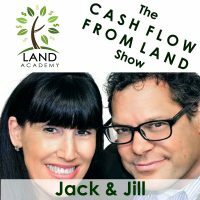 In this episode, Jill and I talk about great land buys. They don’t matter, we don’t sell it. Great show again, Jill. Before we start, let’s hear some funny stuff that happened to us recently. Why didn’t think of that? We should talk more, you and I.
I can’t … There’s no Scottsdale women’s group. TBA everything. Well, I’ve got one person that already signed up. You’re that perfect person to host a thing like that. I’m pretty excited. I’m going to do it here and then, back and forth in California as well. I think that would be really fun. Hey, before we start the show, let’s take as question posted by one of our members on successplant.com, our online free community. Oh, question. Exactly. Love it. This has happened to us, it’s happened to anybody who’s probably done more than 20 or 30 transactions. Land type transactions … Sometimes people buy on terms and they leave stuff laying around. I mean, 95% of the time it’s maybe 99% of the time. It’s a good deal. The only thing you really want to be concerned about, that directly answer the question seriously is, if they leave some environmental hazardous stuff around. That’s never happened to me. I’ve heard stuff like that. Man, if somebody leaves a trailer around, especially if it’s a nice one, I don’t think it’s such a bad deal. Yeah. Well, now it’s not vacant land anymore. Exactly, Jill. Now, it’s like, you know. Find some money in there. That’s what just happened, I think. That’s how I would describe it. If you have a question or you want to be on the show call 8-0-0-7-2-5-8-8-1-6. Today’s topic, great land buys do not matter, if they don’t sell. This is need of the show. Jill, how do you sell real estate online? What do you do personally? Put it everywhere and price it right. Everywhere and price it right. That’s 2 points there. To price it right, you got to buy it right. Man, I sound like a broken record sometimes. Well, that’s it, show’s over. Here we go. No. For new people, it happens all the time. That’s really what prompted the title of this show. People have a lot of questions before they start out in this about sales. Not so much about acquisitions for some reason. Probably, because we talk about acquisitions all the time and never about sales. We sell we everything overnight, is seems like. You know, the whole key is that you got to prep for sales right from the beginning. You have to get the internet ball rolling. I cover it in the cash-flow [inaudible 00:03:41] land program 400 times. You got to start the sales process long before you have any inventory of property. I see people on Success Plant very early in their careers taking my advise very seriously. Starting websites. Getting a phone number established that’s never going to go away. They don’t use your cell phone kind of thing. Prep for sales right from day one. Long before you learn how to buy and sell real estate the right way. I love it. Well, we talk about that. I think I’m repeating you, but in the program …. Jack, you know, as you’re building this and you’re thinking about it. Get your website going. Get your media ball rolling and all that good stuff. You have a presence out there when people come and find you. That’s part of your sales. You’re going to put your property out there everywhere. You want people to be able to find you. That’s it. That’s kind of funny. You know what also I was going to say, if they don’t sell, don’t … I watch some of our people get a little panicking. They’re like, we didn’t … 7 days went by. Okay. Hold on a moment everyone. Sometimes you can get a little anxious, you know. You just got to sit back and wait. As sure as you, you know … I watch everybody do this, so 7 days go by, they panic. 14 days go by, panic. Then, day 15 it sells. Oh. Then, by the way, nowadays 16, 17, 18, 19, and 20. Here come more calls and you go, oh man, I could of sold it for more. It’s hilarious, but if you do it right … You know, and like Jack and I say, “Put it out there everywhere.” Just be patient. It’s okay. Don’t panic. Don’t get hung up on that 1 property. It’s appropriate for me to mention that there’s only 2 reasons property doesn’t sell, in my opinion. If you listen to this show, you’ve heard me say it now 10 times probably. Number 1 is it’s priced too high. That happens a lot with houses and mortgages and stuff, because you know. Just because you buy it, you know, and pay on the mortgage for 5 years, you’d be shocked at how little the principle has gone down in a short amount of time. That’s why people get in trouble with houses. If you pay cash for it like this and you buy it right, you’ve licked 1 of the 3. Property that’s not priced right doesn’t sell well. That’s ridiculously [inaudible 00:06:07]. Secondly, it could be the greatest priced property in the world, but if nobody knows about it, it’s not going to sell. The second thing is you gotta just post it everywhere. We run through that in the cash-flow for land program in great detail. You have to put a system together and regardless of the type of property or the fact that it’s sold overnight. You knows who going to buy it or any of that, you need to post it in the beginning of your career, in a machine-like fashion every single place that you’ve established on the internet. Well, let’s list them. Zillow, Trulia, Craigslist, eBay … Potentially eBay. Your own website. Land Watch. Land and Farm. Eaglestar.net. If you’re a platinum buyer … If a pro-member and you have data to doorstep, send it to me or our staff and we’ll get it on the Wednesday … We call it the Wednesday hum special, but you’re automatically part of the Platinum Seller’s Club. Thousands and thousands of people get an email, with the list of property every week. That sells the heck out of it. Half of it’s acquisitions, the other half is sales. If you do a great job on the first part of it, the second and you have a machine-like execution of the second part. Which should take you maybe 10 minutes once you get good at it. Sell it. You’re right. Once you spend the time and make the posting look great, it’s no big deal. They’re copy and past that everywhere. Right. You know, you have your photos, have everything all done. It’s silly not to put it everywhere. It’s funny, but both of us … I can tell we have lack of words for this topic. Does it seem … You know what, that’s a good point. Thank you, Jack. It seems simple, but people forget things. I’m like, okay, what else? Well, I put it on Craigslist. And it’s not selling. Well, there’s 19 other places you’ve got to put it on. Right. Exactly. We made it … It was kind of cute. It was funny that day, you know, you make … You’re right. You need a checklist of not only where you’re putting it, but what’s in your posting. You know what? Keep that consistent template. You know, put in your phone number, your email address. You know, every little … Have a template about every little property. You know, make it easy on yourself. Then, every property you have, you just make sure you fill in all those things. You know what? You’ll go, oh, I need to add a … I need to be sure now to think about taxes, because I wasn’t seeing that in my other postings and I get a lot of questions. Now, going forward, you’ll address whatever the taxes are if there are any. Yay or nay. Is there an HO or not and HOA. You’ll figure out as you go one. Oh, I need to put that in each posting. You’ll grow it. That’s what you do. Then, just be consistent. Make it easy like you always say, Jack. You’re good at that, Jack. I got to tell you. It’s taking the easy way out. And I’m crying on the inside. So silly. You’re really good at setting up a system and then, it’s a no brainer. You know why? You don’t want to talk about it. You don’t want to feel it. I know, that’s what it is. I know, that’s the root of putting these systems together. I have a system when I wash my car. I just want to think about it ever again. Yeah, you’re right. This is the technical 2. 2 minutes of property investment advise from our 15 year, 15,000 plus deal experience. Usually, it doesn’t even take 2 minutes. Please at the beginning of your career, get a phone number and an address that will never go away. I see a lot of people make this mistake. I personally made this mistake. I can’t say it enough and it costs money. That’s why I think some people don’t do it. You need to get a … Not your cell phone number. You need to get a phone number and an address, like a UPS or a … Not a PO Box, but like a UPS store or like a parcel store. Get a permanent address, because you’re going to get tax bills and you’re going to get returned mailers. Accepted offers for years to come. Jill and I do offer we sent out from 2004, ’05, and ’06. 10 plus years ago and our phone number has never changed. We get phone calls on these numbers from years ago. You want to make sure that … You want to capitalize on your work. You’re sending these offers out, because you want people to send them back. You want to give them the right amount of time. Heirs and people like … When people pass away, the kids find these letters that we’ve sent from years ago and they immediately call us, so they can check it off their list. It’s super important. What’s cool about that, I wonder if they have any other letter, who’s gone? You know, that they didn’t do that. We are the lucky recipients, because they didn’t do that. I have to ask, Jack. Is this really permanent, because of what’s going on in our little world right now? No, but this is an appropriate time to describe … Go ahead, Jill. We’re getting kicked out of our office space. This is actually a real estate situation. We have had our offices in an office share for 10 plus years. Actually, more than that on and off. Someone purchased this building, so we’re in an office share thing with about 20 other people. You know, it’s an executive office. It’s owned by a local person here. Somebody bought the huge building that we’re in. Essentially, just gave us notice. I mean, I’m sure it’s not legal. For me, there’s all kinds of stuff we can do about it, but I have multiple companies to run. I’m not going to pursue it, but we have like 2 days to get out of it. We’re literally moving after this show. It is so funny how it … We’re just like, we’re not going to … We could ride it out a little bit longer, but we’re like, you know what? We’re out of here. We’re going to jump ship. We don’t need this right now. What’s great is, because I’m looking around. I’m like, gosh, I feel bad for the people that are not setup like we are. Their mail comes here. It probably came here for 20 years, because that’s how long this place has been going. I feel bad, 20. They’re probably scrambling, going, what do I do right now? We found an even better … You know, it always … Things happen for a reason. All of our phone numbers are forwarded through Vonage. We actually own our number now. Yeah, Jill. I mean, we could pick up and do this in Alaska in about 30 minutes. We take up a like a third of it. We all got a letter under our door a couple days ago. It says, “You got to be out by Friday.” What I noticed, is that it’s just amazing how people react. We cut our rent in about half. Half just seems to be the theme in our lives. There’s another place a crossed the street. She went and got it for half. Exactly, and I like it better. We turned a tragic thing into a positive thing. Everybody’s still running around going nuts. We’re done. We’re ready to move. Getting that funny. Well, some people are running around, I think. I see that and I see some people that don’t get it. They’re walking around like business as usual. I’m like, you don’t even know what’s coming. No. I saw that too. Have you noticed there’s some changes coming. They’re systematically turning the internet off and all kinds of stuff. It’s pretty funny. Tell me, when you’re ready. I’m going to add to it. If you have a question or if you want to be in the show, call 8-0-0-7-2-5-8-8-1-6. We own that phone number too. Okay. My inspiration is sometimes you only need to be relentless to succeed. You like that? It ties into this. You and I are like, some people this might sink their ship. You know? We were talking about this earlier on a completely unrelated topic. There’s some people in our lives who adamantly resist change. I love change. I don’t know. I thrive on it for some reason. Yeah, that’s what I think. I always look at it as an opportunity. You know, I wouldn’t see like bankruptcy as a welcome change. Even then, you could make a good thing out of that. Even then. I know people that have used that as a positive thing. Sure. Dave Ramsey’s brags about it almost. We been there done that. You know? I like that. You and I are relentless. I think that has helped us a lot. I know that there’s a lot of people years ago that were doing similar things that we did, just investment business. They just closed up. I’m like, what the heck? You know. Even little things along the way. I remember Jack when we used to do Paypal for real estate and Paypal said, “No. You can’t.” Then, people went, oh well, then what am I going to do. That was the greatest thing ever. Right. There’s going to be other things. Figure it out. Don’t let … I tell people this too. Don’t get hung up on it. It should be a speed bump. It shouldn’t sink the ship, you know. You know, little things happen right now and other things. I’m like, all right, come on. This is what’s going to keep you from everybody else. Why you’re going to do better than everybody else. You’re not going to let this slow you down. It is inspirational, Jill. Thanks. Join us in another episode. Where Jack and Jill discuss how to use information, that’s me. Hey, get there first. Good show, Jill. I’m glad we’re moving. Me too. Yeah, we won’t miss this construction going on around here. What would be happen next, we’d come in and our office doors would have like construction zone tapes on it and hardhat required over the doorway or something. That’s really funny. Initial real estate people can … They’re not afraid to show they’re muscle for some reason. I’m not sure why. I was in commercial real estate for awhile, early in my carrier. I appreciate that we have 1 foot out the door here. More than 1 foot out the door. You chose to park in the building owner’s parking spot today. I’m like, that rocks. We’re like, yeah. What are they going to do? Hilarious. I think you should park there. That made me feel … That actually … This is how good we are together. Some people would like panic. I’m like, that made me just warm and fuzzy inside. Yeah, take that. You saw the girlfriend [inaudible 00:18:05] you. Jack and Jill. Information and inspiration. Let’s go buy some property.